On April 30, renowned writing trainer and coach Ann Wylie will be in Minneapolis-St. Paul for a half-day writing workshop sponsored by Minnesota PRSA and IABC Minnesota and hosted by the Master of Business Communication program at the University of St. Thomas (downtown campus). 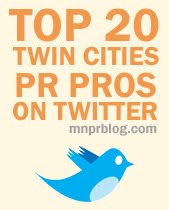 Minnesota Public Relations Blog recently connected with Wylie on writing and more, with questions crowdsourced from our readers. 1. What can participants expect at the April 30 writing workshop? You'll learn to Catch Your Reader by Thinking Like a Reader and Cutting Through the Clutter. We'll look at ways to position your information in the reader's best interest and to make every piece you write easier to read and understand. The results: You'll increase your chances of getting readers to read, understand, believe and act on your message. You can also expect me to be giddy about being in one of my favorite U.S. cities. I adore Minneapolis! Despite all of my travel, I never get there enough. 2. I would like to hear your thoughts on writing leads and headers in a story. Well, I have lots of thoughts on leads and headlines. To boil them down, the first step is to decide which kind of lead or headline to use. 1) Benefits headline. Always preferred, with this type of headline, you focus on the WIIFM to your readers. 2) Feature headline. Can you grab attention by surprising and delighting your reader in the headline? 3) Web headline. If you're writing a Web page, you need to lead with the topic word and write a short, clear headline, nothing clever or obscure. 4) News headline. Overused, this type of headline is for urgent news. And don't forget the deck, that one-sentence summary under your headline. It's one of the most important -- and most overlooked -- elements of display copy. For most pieces, I prefer a feature lead, which is concrete, creative and provocative. Benefits leads are a close second. You might occasionally use a news lead. I'd avoid announcement leads ("XYZ Company today announces that ...") and fact packs (cramming who, what, when, where, why and how into the first paragraph) altogether. 3. What considerations should there be when writing across different channels? * Web headlines start with the topic word and are very clear; in print, you have more headline options including my favorite, the feature head. * E-mail subject lines should be five words long, focus on the benefit to the reader AND be provocative. * With print, it's easier to explain complex concepts, so choose print for thought pieces. 4. Your writing suggestions involve many readability statistics based on research. How did the transformation occur in which you looked at the written word that way? The minute I learned of Readability Statistics, I was hooked! That must have been 10 years ago or more. My little secret is that I'm not a naturally talented writer, but I do have a lot of tricks. I believe that whoever has the best tricks wins in writing. At our workshop, I'm going to share some of my favorite tricks with you. 5. At my son's elementary school, cursive writing no longer is taught. What are your thoughts on that? I find the evolution of language and writing interesting, but it doesn't bother me when things change. Your son is probably way faster than I am at typing a text message. That's literacy today ... just as neat handwriting used to be when I was in school. Personally, I've always struggled with sloppy handwriting. (I call mine "artistic"; a euphemism for sure.) So I'm a little relieved that the pressure to have neat handwriting may be coming to a close. 6. You used to work for Hallmark Cards. What's your favorite saying from a Hallmark card? "For 40-odd years in this noble profession, I've harbored a guilt and my conscience is smitten. So here is my slightly embarrassed confession -- I don't like to write, but I love to have written." Register online for Ann's workshop today.